Or at least, master sergeant of the universe. Congratulations, my sweetie. Here's a shot of one of the socks I have been working on, intermittently, for a while now. Lovely stripey yarn. Who loves the stripey yarn? Me! Me! It impresses non-knitters no end. Even some knitters, too! And this blurry shot is me with the Adamas, for scale. Small D took the shot just as the camera died. I hope the recipient likes it. She is a bit taller than I am, so I think it will at least be a better fit for her :) If I make this again in the same weight of yarn, I will stop at 10 repeats. Behold, many pictures. If you don't come for the knitting, move along...nothing to see here. For the rest of you, here's Adamas pinned out on the double bed. It blocked even larger than I expected. Here you can really see the pattern details well. Blocking is truly magic for lace knitting. No more wet noodles now! I like this detail shot because you can see the fluff and imagine the softness of the cashmere. This is a doofy shot but I tried to reduce two similar pictures so that the gate is the same size in both. You can really see how the lace has opened up and the shawl has GROWN after blocking. Knit! Knit like the wind! That's been me this past week or two. Adamas is off the needles, but still unblocked. I am contemplating gifting it to someone who is leaving England to return to the States, but I'm not sure if it would be her cup of tea. I'll have to consider it some more, while I block. I cannot believe what a quick knit this has been, and what a FUN one! I want to cast on for another right away, but am forcing myself to return to the stripey socks instead. Dover was lovely - the castle is amazing. We spent the best part of two days there. I won't post castle pictures, because they're all detail shots. The place is so vast that you can't get a full-castle shot unless you're quite some distance away, and I was always in a car at that point. The tunnels, the keep, the displays, the Ghurka band who were performing, all of it was really interesting. I give this castle two thumbs up. We also went over to the cliffs and walked about, although being RIGHT UP ON THE EDGE with children proved to be pretty nerve-wracking. I did get this shot of The White Cliffs of Toe-ver for you, Susie My Friend! No shots from over the edge of the cliffs, though, thankyouverymuch. Well, we'll be trying an Internet break for the next day or so. 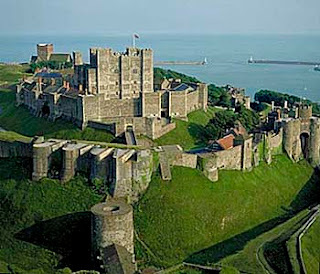 Time for a family trip to Dover, where we want to visit this castle, walk through the wartime tunnels there, and see the cliffs up close and personal (and look for those bluebirds). With gasoline prices edging toward insanity, this option seems rather clever! 'Albany, NY - With no end in sight to the rise in fuel prices, commuters in Albany are using a network of trebuchets to save on gas and the airlines are taking notice. Click here for entire article. Very funny! This article really resonated with me today. It's about taking time away from Teh Interwebs - the better to live your real life. E-mail is my addiction. That, and checking up on my Google Reader bloglist. I have made great strides toward lessening that addiction, I think, in the past couple of years. Still, if I am away from e-mail for more than a day, I get antsy. If I can't Google something instantly, I get cranky. How did I survive, waaaay back in 1992, before I had a computer at home? How did I exist with only dial-up? Inconceivable as it is, I DID exist, survive, even thrive, without net access for decades! Surely I can do it for one day a week? I'm also winnowing my bloglists, by creating an UltraFaves department that I check daily (ten or fewer), and then mass deleting the rest if it gets overwhelming. Seriously, though, have a look at the article. It's a good read. This is a very interesting article, all about clearing the clutter in our lives. There's quite a lot about a man attempting to pare down his possessions to just 100 things. And does stash count as one thing? I'm fairly flying along with the Adamas shawl. I can't believe I have found a lace pattern that I can work on while watching telly, or talking to friends. Amazing stuff! I stuck in a lifeline and pulled it off the needles this afternoon to figure out roughly how much more I need to knit. My gauge is MUCH looser than the designer's intent. Here's what 9 repeats looks like, spread out but not stretched, with 5-year-old child for scale. I am thinking 3 more repeats, plus the edging (approximately another repeat in length), should do it nicely. The shawl pattern calls for 14 repeats and I think 12 in my looser gauge is more than enough. What do YOU think, Gentle Readers? 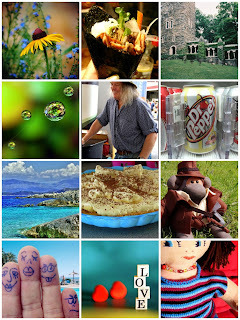 My friend Lynn is holding a Blogiversary Contest (go wish her well - it's been TWO years!!) and pictures of your calendar(s) are the entry requirement. These are mine - the top is a knitting page-a-day calendar (I am saving about half the patterns as "might knit possibly") and below is my planner, without which I do not exist. If I don't have the Blue Book of Doom, I have no idea what I need to do. No wall calendars, as we don't have a good spot in the kitchen to post one. So Lynn, that's my entry, and congratulations on two years of fun posts to you! In other news, I spent waaaaay too much time doing laundry on base today, as many folk had the same idea. Fortunately, I popped the wet stuff in baskets/car and took a break to have lunch with my honey while the dryers were all full. Said honey found me a swift! For a pound! At a boot sale! I am SO happy about that. I want to blog it but I'll need to wait for the sunshine. It's a vintage three-armed wooden wool winder, called a "Nitta Wool Winder," and it even came in the original box. Such a nifty gadget. I have already used it to wind my skein of Hunt Valley 2-ply laceweight cashmere that has been ripening in stash for over ten years. That skein is now 5 repeats worth of the Adamas shawl, and growing. See the pic below. Quick review - Adamas pattern? VERY simple and satisfying to knit for a lace pattern. Addi Lace needles? Awesome...they slip along so quickly but the wool? Does. Not. Slide. Off. Ends. It's truly a lace-knitter's miracle. The Game - Have you seen it? Edited to add: I have explained my own "answer pics" below, since they are a little hard to decipher unless you're....me! This is a meme I have seen on several blogs now. Curious, I clicked the link to find out more. In a nutshell, you answer the following questions in picture form and post your mosaic. Very cool, indeed. Here's mine. By the by, the celebrity crush is Phil Harding (IloveyouTimeTeam!).
. What high school did you go to? Kent School in CT - that's a pic of the back of the chapel there. 6. Favorite drink? Diet Cherry Vanilla Dr. Pepper...do they even MAKE it any more?